If you call Glastonbury by its proper name, it’s the Glastonbury Festival of Contemporary Performing Arts. So, it shouldn’t come as a surprise that there’s plenty of theatre to see as well as music. Ed Sheeran, Radiohead and Foo Fighters headlined this year – but over in the theatre and circus area, near the famous West Holts stage, there was a weekend’s worth of shows to be had. It is difficult to describe the thrillingly diverse nature of the performances. For instance, without even seeing any staged shows, punters can enjoy tens of roaming street performances. There were stiff-upper-lipped cricket commentators lambasting passers-by who cut through their ‘pitch’, safari guides with strap-around Britney mikes commentating on roaming wildlife (actors, Lion King-style) and masked acting catching unwitting punters off guard. And groups of naked pensioners. Think the Royal Mile during the Fringe, only in a field. Inside the performance areas your attention is concentrated on three key areas: the Astrolabe, the Circus Big Top and the Cabaret Tent. 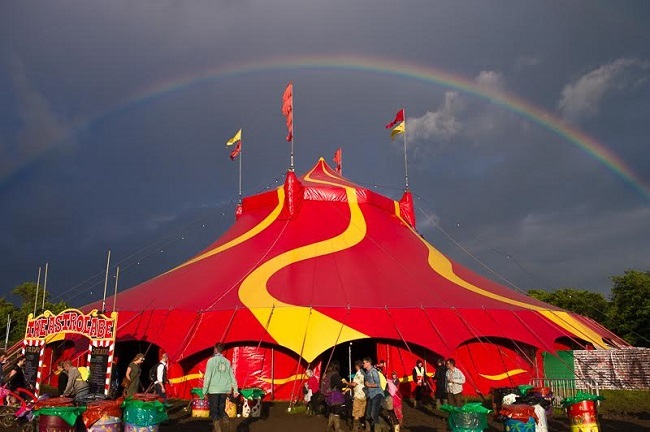 The circus big top houses the most physically ambitious productions, the likes of the trapeze, and you’ll find the more experimental shows in the Astrolabe, ranging from gig theatre to musical comedy. There’s very little straight theatre, because, says the stage manager of the Astrolabe, the likes of Shakespeare haven’t worked here in the past. He knows his theatre: in his twenty-third year he’s the longest-serving stage manager at the entire festival. However, if Latitude can pull off traditional staging and narrative-led shows, Glastonbury can too – perhaps in an outdoor amphitheatre to draw attention? We understand the production challenges in doing this, but integrating theatre seamlessly into the line-up means continually tweaking the formula. Back in the Astrolabe, Demon Barber: The Lock In caught my attention for its mix of technical prowess and garishly fast-paced comedic storytelling. Jasmine is the land lady at an old English pub. She has traditional taste and only likes folk music – so what happens when a troupe of street dancers breakdance to hip hop on her turf? 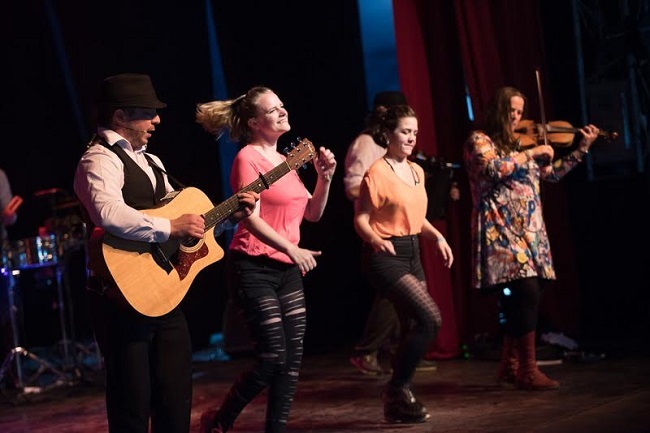 The show – written by BBC Radio 2’s five-piece resident folk band also called The Demon Barbers – has disarmingly good dancing by its cast, coupled with a live musical accompaniment by the band as Jasmine comes around to the idea of contemporary sounds after all. It has the energy of a coming out story (helped by Jasmine, who is in drag), and is awash with bright colour and bundles of energy that should elevate it beyond its Fringe launchpad. The other defining theatre moment, over in the Circus Big Top, was Staged by Circumference. 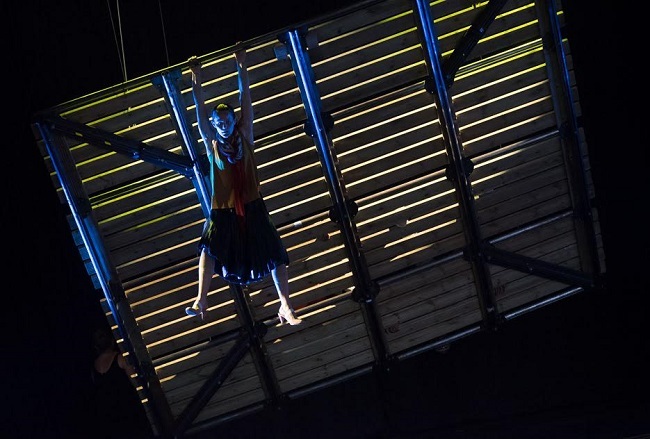 One of five Arts Council England commissions at Glastonbury, and a worldwide premiere, the physical theatre piece takes place on an aerial platform elevated ten metres from the floor. As our three protagonists traverse from one side of the platform to another the platform/’stage’ lopes at severe angles – sometimes almost vertically – as the trio cling on. Sometimes they’re huddled together in a big muscular body ball when the wooden stage is horizontal, but sometimes they’re clambering apart, or hanging precariously. As well as technically impressive, it’s the physical act with the most heart. There’s a compulsion to stay afloat despite the odds as the gyrating stage makes this an endlessly compelling challenge, with a rich and diverse musical accompaniment. 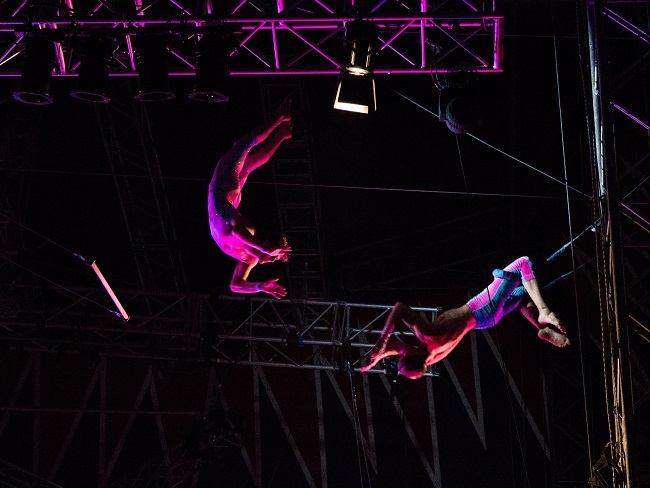 The circus show not to miss was High Society, a trapeze act by Above and Beyond, the company run by 69-year-old active performer Mike Wright. Despite the young cast, who are introduced by a trapeze artist singing wistfully while suspended from the heights of the Big Top, it is Wright people are here to see. He performs the flying trapeze to huge cheers, wearing an outfit of roaring pink and blue sequins to go with the Twenties feel of the show – and its title – and he gives the rest of the show enormous power. The rest features doubles trapeze, swinging, acrobatics and cradle from a ten-strong cast. There’s something addictive about how congruous it all is: the dazzling outfits, the pace of the swinging trapeze, and the odd flicker of narrative (some singing at the beginning) make this feel as page turning at that bastion of Twenties hedonism, the great Gatsby. Closer to the ground, contemporary circus ensemble Circa excelled with Humans. The show, about survival, struggle and strength, draws parallels with Circumference, although – with actors bounding all over the stage – Circa’s Humans was more immediately athletic than ambiguously experimental, even if they were as visually stirring. All uniformly in bronze, the cast spend calmer moments struggling to get dressed and undressed, then rawer segments exploring the physical limits of our bodies with ambitiously choreographed movement. Expect bodies to be thrown, spun, manipulated and pile atop one another in this heart-stopping show. For the most part, shows are punchy at around 10 or 15 minutes, although the ones reviewed above were the larger productions which lasted an hour. It means that the theatre and circus fields are excellent value for punters, who can spend an hour or so in the area and see three or four live performances. Also sustaining our attention were The Flying Dutchman, a charming troupe of male jugglers in multicoloured waist coasts who were naturals interacting with the audience. It made for a particularly warm experience, as did Sebastian Velade’s innovative juggling, because he balanced pins unusually, on contorted parts of his body as he managed five pins at once. He now works with Mike Wright of High Society at circus company Circomedia, as does Rod Laver, who performed a miraculously weird show which culminated in him juggling five ping pong balls at once. Top marks must also go to Wooky Hole Circus for the most fully equipped and diverse circus show of the weekend, which generated some of the biggest crowd roars. And Nadia Lumley conjured a particularly sedate mood in the Big Top after her mysterious one-woman show. Lumley is a cyr wheel specialist, and her show essentially is her and the wheel on stage alone. Her relationship with the wheel creates a vibrant intensity, as she tugs at it or gives it a mournful look. At the end of the show – after an incredible amount of energetic gyrating in the wheel – she sits slowly next to it, as she watches its movements come gradually to a stop. That she creates an eerie presence between herself and her tool is the show’s best asset, beyond her stirring athleticism. 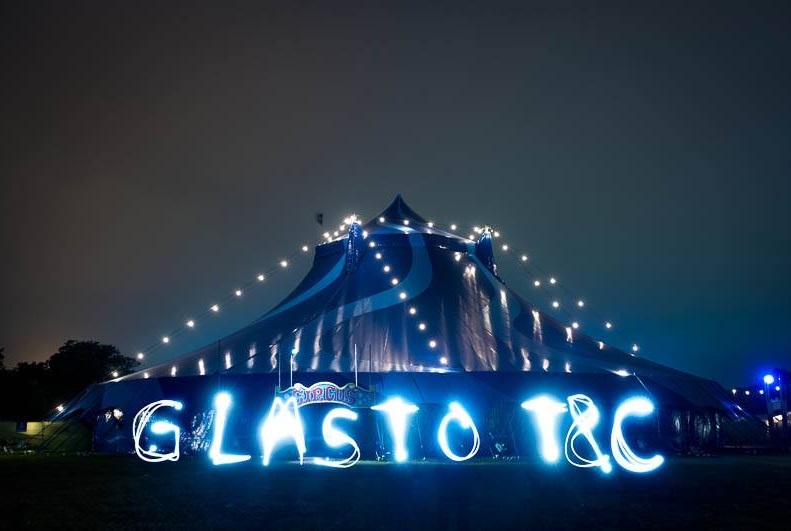 At Glastonbury, there is as much to see wandering the theatre and circus fields as there are scheduled performances. So, no matter your predisposition for theatre, the area’s constant change of pace will surprise and delight. In 2019 (2018 is a fallow year) we’d like to see a touch more straight theatre, perhaps outside in a new amphitheatre area, although we appreciate the production challenges which make this challenging. Still, there’s the feeling that people enjoy being outside at festivals, so theatre must eventually find a stronger way to reconcile that with their art. For three days this rarely spoken about stretch of Glastonbury has been one of the most concentrated and deepest examinations in theatre in the UK – and we can’t say better than that.